Even Realtors need to take a break once in a while. When I do take a break from selling real estate in Idaho Falls for The Group Real Estate. It is typically during a holiday. In this blog I would like to write about one of my favorite holidays: Christmas. More specifically I would like to talk about the Christmas tree. I did some research on the topic and have decided to share that with you. 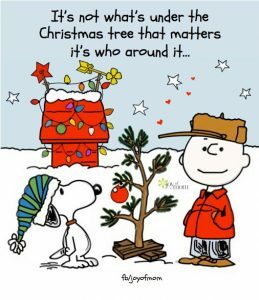 We just finished the 2017 Christmas season and are getting ready to take down our tree which got me thinking. Why is it that we set up a pine tree in the house and put little glass and plastic decorations on it? Long before the advent of Christianity, plants and trees that remained green all year had a special meaning for people in the winter. The history of a Christmas tree can be tracked from the earliest winter solstice celebrations, to Queen Victoria and all the way to the annual lighting of the Rockefeller Center Christmas tree. Christmas trees are grown in all fifty states including Alaska and Hawaii. Just like today people decorate their homes during the festive season with pine spruce and fir trees, ancient peoples hung evergreen boughs over their doors and windows. In many countries it was believed that evergreens would keep away witches ghosts and evil spirits and even illness. Germany is credited with starting the Christmas tree tradition as we now know it in the 16th century when devout Christians brought decorated trees into their homes. Some built Christmas pyramids of wood and decorated them with evergreens and candles if wood were scarce. It is a widely held belief that Martin Luther, the 16th-century Protestant reformer, first added lighted candles to a tree. Walking toward his home one winter evening, composing a sermon, he was awed by the brilliance of stars twinkling amidst evergreens. To recapture the scene for his family, he erected a tree in the main room and wired its branches with lighted candles. Personally this would make me very nervous. This year was my dog Bart’s first Christmas. He did not do well as a young puppy and eating the Christmas tree and its decorations. If there were candles with an actual flame on them my house would be ashes because there is no doubt in my mind that he would have tipped one over catching the tree on fire. The Pennsylvania German settlements had community trees as early as 1747. But as late as the 1840’s Christmas trees were seen as pagan symbols and not accepted by most Americans. It is not surprising that, like many other festive Christmas customs, the tree was adopted so late in America. In 1846 the popular royals Queen Victoria and her German Prince Albert were sketched in the Illustrated London News standing with their children around a Christmas tree. Unlike the previous royal family, Victoria was very popular with her subjects, and what was done at court immediately became fashionable—not only in Britain, but with fashion-conscious East Coast American Society. By the 1890s Christmas ornaments were arriving from Germany and Christmas tree popularity was on the rise around the U.S. It was noted that Europeans used small trees about four feet in height, while Americans liked their Christmas trees to reach from floor to ceiling. The early 20th century saw Americans decorating their trees mainly with homemade ornaments, while the German-American sect continued to use apples, nuts, and marzipan cookies. Popcorn joined in after being dyed bright colors and interlaced with berries and nuts. Electricity brought about Christmas lights, making it possible for Christmas trees to glow for days on end. With this, Christmas trees began to appear in town squares across the country and having a Christmas tree in the home became an American tradition. 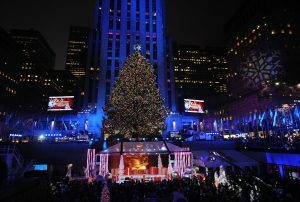 The first tree at Rockefeller Center was placed in 1931. It was a small unadorned tree placed by construction workers at the center of the construction site. Two years later, another tree was placed there, this time with lights. These days, the giant Rockefeller Center tree is laden with over 25,000 Christmas lights. It is a yearly event still to this day. Some other interesting facts are that Christmas trees have been sold commercially in the United States since about 1850 and today nearly one hundred thousand people are employed in the Christmas tree industry. Ninety eight percent of live Christmas trees are grown on farms however in Idaho you are able to obtain a permit and go cut your own in the mountains. In those farms there are seventy seven million Christmas trees planted each year California, Oregon, Michigan, Washington, Wisconsin, Pennsylvania and North Carolina are the top Christmas tree producing states. Now you have had a small history lesson on the Christmas tree be safe and have a happy holiday!